Early this morning approximately 8:30am, there was a serious car accident involving a Holden Astra and a Mazda. Involving the Astra cutting across the median strip of the Hume just past the Picton exit and hitting the Mazda in a head on collision. A Mother and her two beautiful twins who were in the Mazda were put in serious and fatal conditions, the mother and son passing away and the daughter left in critical conditions in hospital. The father of these children and husband of the wife is left to deal with these condition on his own. I have started the gofundme to support darren(husband) with on going medical costs for Sienna, and to assist with any funeral expenses. 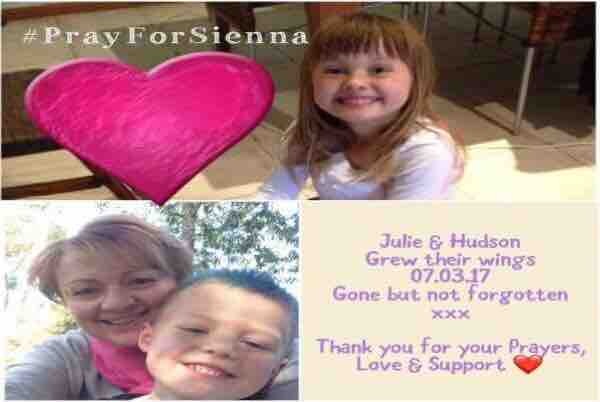 Our thoughts and prayers are with the beautiful Bullock family and especially Sienna. Hi all, just so no ones gets concerned, one of the donations made was incorrect so there had to be a full refund to that person. Family is aware, and knows of this situation. This gofundme campaign has really shocked me, and is going so well. Thank you to all who have donated. Regards, Campbell and Kylie Hicks. Our hearts go out to Darren and little Sienna. Your lives have changed so tragically and irreversibly. Our love also to Val, Dean and Lisa . On behalf of the Mount Annan Christian College Community, Our prayers and thoughts are with all involved during this difficult time after this tragic incident.